In this Friday, Feb. 9, 2018, file photo, athletes from Russia wave during the opening ceremony of the 2018 Winter Olympics in Pyeongchang, South Korea. Russia says the IOC has reinstated the country to the Olympic movement despite two failed doping tests by its athletes at the Pyeongchang Winter Olympics. In quotes carried by the TASS news agency, Russian Olympic Committee President Alexander Zhukov said a letter had been received earlier Wednesday, Feb. 28, 2018 from the IOC announcing the nation's reinstatement. Russia's ban from the Olympic movement was lifted on Wednesday despite two failed doping tests by its athletes at the Pyeongchang winter games. President Vladimir Putin hailed the move during a Kremlin award ceremony for Olympic athletes, saying "we must turn this page." "We must draw relevant conclusions for ourselves, but I hope that international organizations also will eventually understand that sports must be kept away from problems unrelated to it," he added. 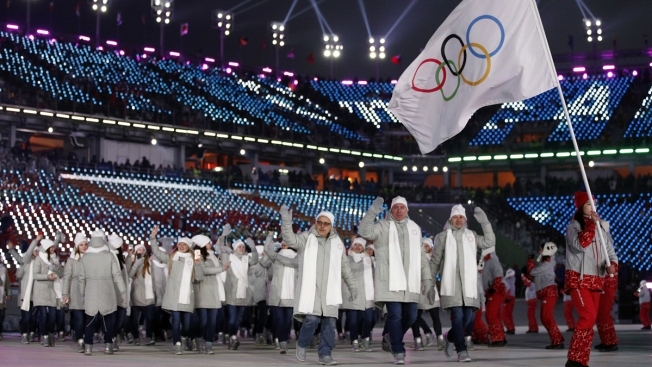 The decision by the International Olympic Committee appears to be an attempt to draw a line under the state-concocted doping scandal that tarnished the 2014 Olympics in Sochi. Siblings and ice dancers Maia and Alex Shibutani visits NBC after winning bronze at Pyeongchang to talk about their unique sibling dynamics, future goals and life after the Olympics. 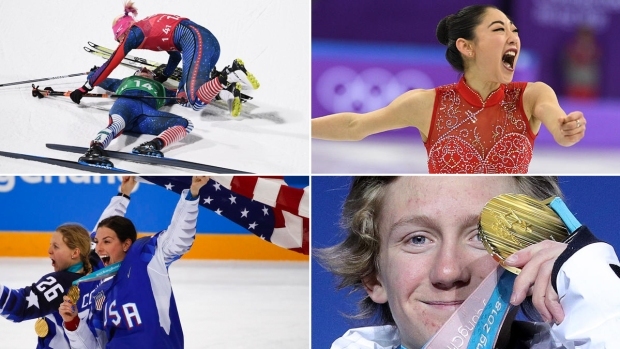 The IOC allowed more than 160 athletes it determined were clean to compete as "Olympic Athletes from Russia" in Pyeongchang earlier this month with a prohibition on the national anthem or flag in venues. "You can take away any attributes, but you can't take away our character, and you have proven it with your performance," Putin said after giving state awards to Olympic athletes in the Kremlin. "It has filled us all a sense of pride." He referred to members of the Russian ice hockey team performing the national anthem after receiving the Olympic gold, saying he would like to thank them for their patriotism. "Millions of people are happy for your victories along with you!" he said. Russia's hopes of marching under its flag at Sunday's closing ceremony in South Korea were stymied by the two positive tests for banned substances, including a curler who had to forfeit his bronze medal. But the IOC said Wednesday that all remaining test results were negative, clearing the path for Russia's return to the Olympic fold. "Therefore, as stated in the executive board decision of 25th February, the suspension of the Russian Olympic Committee is automatically lifted with immediate effect," the IOC said in a statement. Russian athletes won two gold medals in Pyeongchang, in figure skating and ice hockey, along with six silver medals and nine bronze. "We put all our souls into that, we won those medals for our Mortheland," figure skater Yevgenia Medvedeva who won Olympic silver, said at the Kremlin award ceremony. "We defended the country's honor thanks to the Russian character," echoed Pavel Datsyuk, the captain of the Russian ice hockey team. "Thank you for your support and a chance to prove that the Russian character will never be broken." "I would like to thank our athletes who were able to perform well even despite the provocations," Russian Olympic Committee President Alexander Zhukov said in televised remarks. "I thank the fans who did not cross the line and what could result in sanctions. Today's IOC's decision is very important for us. The ROC is an absolutely full-fledged member of the Olympic family." Russia also complied with financial sanctions by paying $15 million for the IOC's two investigations into the scheme and toward future anti-doping work. Vitaly Smirnov, the head of an anti-doping commission set up by Russian President Vladimir Putin, did acknowledge on Wednesday that "we have a long way to go to get rid of the mistakes, which we made in the past." 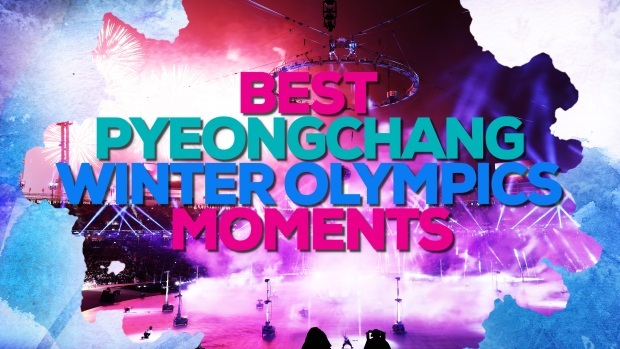 Some of the most spectacular moments of the 2018 Winter Olympic Games in Pyeongchang, South Korea. But Russia continues to deny there was state involvement in the plot, which included urine samples in supposedly tamper-proof bottles at the 2014 Olympics being swapped out for clean samples through a "mouse hole" in the wall at a laboratory in Sochi. The IOC decision to reinstate Russia has no bearing on the International Paralympic Committee's earlier ruling to maintain the country's ban. The only Russians at the March 8-18 Pyeongchang Games will be known as "Neutral Paralympic Athletes," mirroring the IOC's compromise.